"Classic combos are classic because the flavors go well together! Dill, cucumber, and smoked fish are combined with a bit of lemon to perk things up. 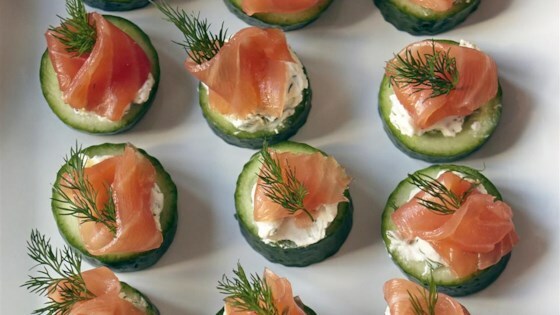 Small pieces of smoked trout would be a good substitute for the salmon in this pretty, easy, no-cook hors d'oeuvre. Cucumber cups can be assembled and kept chilled in an airtight container 1 day ahead of time." You can substitute reduced-fat cream cheese for cream cheese, if desired. Substitute Boursin cheese and add a couple capers. Had this in England about ten years ago, and have been making it ever since. I must have missed the boat with this recipe. Seems everyone who reviewed it, loved it. I thought it was nasty and threw it out. I tried it the first time with Boursin cheese and capers as mentioned by the one review and it was delicious! Made homemade Boursin cheese and used. Hubby loved this recipe. A beautiful and delicious appetizer. The combination of textures and flavors is divine. Didn’t modify the recipe one bit. These will be a party regular for me from now on. Followed recipe, cumcumber slices were a bit too thick. Good flavor, nice presentation. I did not make changes. They turned out beautifully. All were eaten and enjoyed by my guests, with many “Yums”. Healthy to boot.